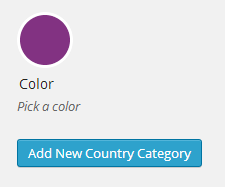 OR if you click on already existing event type category tags you should see a color circle to change the color. STEP 3: Click on this and change the color and save changes. 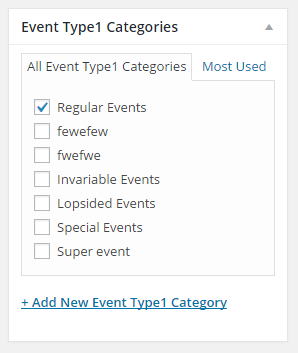 Next you want to make sure this event type term “Regular Events” is assigned to event(s) which you can do from event edit page under “Event Type1 Categories” dialog box. STEP 5: In eventON shortcode generator set “yes” to Event type color override or add the text etc_override=”yes” into your shortcode. Click save and you should see your calendar event colors being overridden by event type colors. To get the event type color to override event’s color, you have to make sure that the event itself has this custom colored event type category term is indeed assigned to the event just like mentioned in step 4.